If you are an animal lover, you will be interested to know that there are at least 120 different animals listed in the Bible. I think God often mentions them in His Holy Word because we can learn interesting things from each one of them. 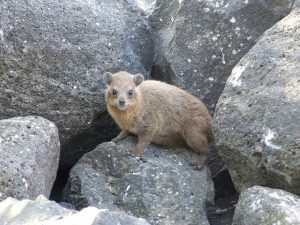 The Rock Badger (sometimes called a coney or hyrax) is no exception. Rock Badgers that live in Israel have short, thick, almost orange-colored fur. They have small ears and thick bodies. When they are full-grown, they weigh about 9 pounds and are close to 20 inches long. This means they are a little smaller than a groundhog. What can we learn from these cute little creatures that will encourage us? Here is one lesson. Because Rock Badgers have no natural defenses, if they wander out into an open field, they are easy prey for their enemies, enemies like the powerful falcon. The rocks not only serve as their homes, but they are also their only protection. Do you ever feel vulnerable, especially when you think about what may be in your future? The Rock Badger shows us how we can feel safe. It depends solely on the rocks for protection, instead of relying on its own strength or cunning. Just as the rocks provide a ready-made protection for the Rock Badger, so the Lord has also already provided all the protection and comfort we could ever need. We just have to humbly depend on Him, like King David did when he prayed, “Hear my cry, O God; give heed to my prayer. From the end of the earth I call to You when my heart is faint; lead me to the rock that is higher than I. For You have been a refuge for me, a tower of strength against the enemy” (Psalm 61:1–3). Before we can have a peaceful confidence in the future, though, we must first admit how helpless we really are. Sin has separated us from the comfort and protection of our Creator. That is why Paul tells us that spiritually we are “… dead in [our] trespasses and sins” (Ephesians 2:1) before we embrace Christ’s forgiveness. In other words, our life has no real meaning or safety apart from Jesus Christ. Beware, though, Jesus didn’t suffer on the Cross for those who are self-confident, i.e. those who are expecting to make themselves good enough for a Holy God on their own. Instead, “while we were still weak, at the right time Christ died for the ungodly” (Romans 5:6). Those who know they need a Savior are the ones who come running to Christ for His protection. There is another thing we can learn from Rock Badgers. They are also illustrations of the changes that God makes in those who trust in Him. Rock Badgers are very social. They live in groups as few as 10 and as many as 80. They communicate with each other using at least 21 different sounds, including trills, yips, grunts, wails, snorts, twitters, shrieks, growls, and whistles. It appears that they make the sounds in order to let each other know how they’re feeling. That reminds us that Christians are repeatedly told to “love one another.” For example, Peter said, “Since you have in obedience to the truth purified your souls for a sincere love of the brethren, fervently love one another from the heart” (1 Peter 1:22). Christians love being together and helping one another. In addition, Rock Badgers also sing. Male Badgers have been observed singing very complex songs that can last for several minutes. That too reminds us of other changes God makes in us when we begin following Him. Christians love Jesus so much, because He has rescued them from their sin, that they also enjoy singing. In fact, Christians are supposed to be “speaking to one another in psalms and hymns and spiritual songs, singing and making melody with your heart to the Lord” (Ephesians 5:19). A believer’s strength comes only from the Lord, and it is always more than enough. “The Lord is my rock and my fortress and my deliverer” (2 Samuel 22:2). “Finally, be strong in the Lord and in the strength of His might” (Ephesians 6:10). I hope that each of you will turn from sin and trust in the Lord’s strength and protection. “Those who trust in the Lord are as Mount Zion, which cannot be moved but abides forever” (Psalm 125:1).